A small creek set in the wilderness of Northern Vancouver Island, flows past a series of moss covered rocks in the lush green forest. Set deep in the back country of Northern Vancouver Island is this beautiful wilderness creek, bordered by lush rainforest and punctuated by bright moss covered boulders. Daniels creek on northern Vancouver Island, long exposure flowing water photograph. 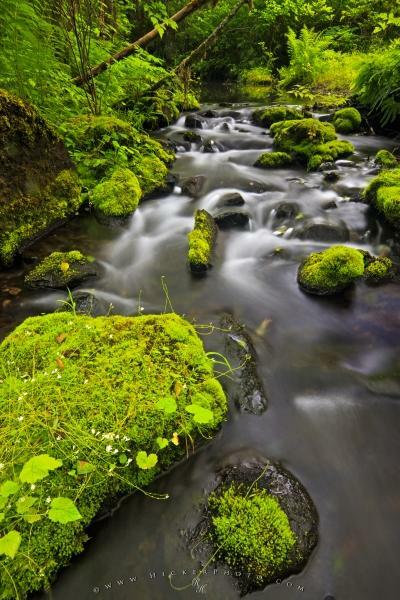 Photo of a creek in the wilderness of Northern Vancouver Island, British Columbia, Canada. Pictures from photo gallery "Nature Pictures"
This picture is part of the photo album "Nature Pictures" - there are more beautiful images waiting for you.